Campaign stall on Broad Street, Oxford, September 2003. I'm on the left holding the banner, with other OxWDM members (L-R) Martin, Dona, Sarah and Ruth. Marching down Cowley Road Oxford with the GATS monster. March and rally during the period of the WTO trade talks in Cancun, Mexico, September 2003. Kevin and Wendy on the stall at the People and Planet Shared Planet conference, November 2005. Campaign: Dirty Aid, Dirty Water, on the privatisation of water in developing countries. Street theatre - G8 Olympics, Cornmarket, Oxford, July 2006. Drawing attention to the fact that the promises made at the previous years G8 Summit by Tony Blair and Gordon Brown, had not been kept. Climate Chaos march & rally November 2006, London. First photo: Jenny, Jo and Sam just behind Jo's shoulder. Second photo: Kelvin, prop-maker maestro. Climate change street theatre/stunt February 2007 on Cornmarket. We were trying to make a point about the relative impact different nations emissions have on climate change: UK a big bucket of water, Bangladesh a eye-dropper amount of water. First photo: Sam, Jo, Karl (Oxford FOE), Martin, Roger & Jenny. Second photo: Sam gets drenched by the UK emissions by a member of the public. BTW, it snowed the day before and was about 0 degrees. What we do for WDM campaigns and justice! 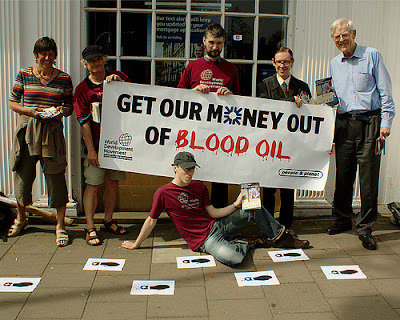 In April 2008 we joined with Oxford Friends of the Earth with a stunt at Carfax tower, asking politicians to stop ignoring aviation in the upcoming Climate Change Bill. Photo: Glynn (Oxford FOE), Andrew as 'Gordon Brown hiding from the truth' and me to the right. We even got on BBC South Today! Short video - 40 seconds. The planes in our climate change/aviation campaigning stunts got rather large... At the Cowley Road Carnival in July 2008, we had a rather large prop to attract attention to the fact that climate change can kill. It was pouring with rain when we were trying to pump the plane up and Kevin nearly got electrocuted. Then we nearly knocked some babies out of arms with the large wing span as we flew down Cowley Road. We went back to smaller props after this one! 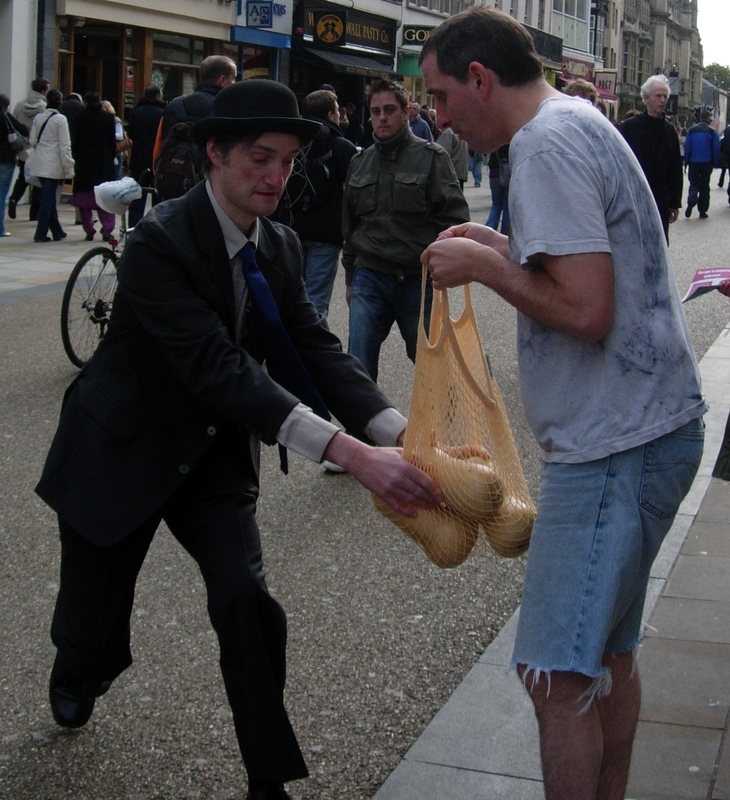 Back in Cornmarket, this time we were netting 'fat cats' in October 2008. This was a stunt on the way the EU trade rules were robbing the poor in developing countries to feed the rich in the global North. 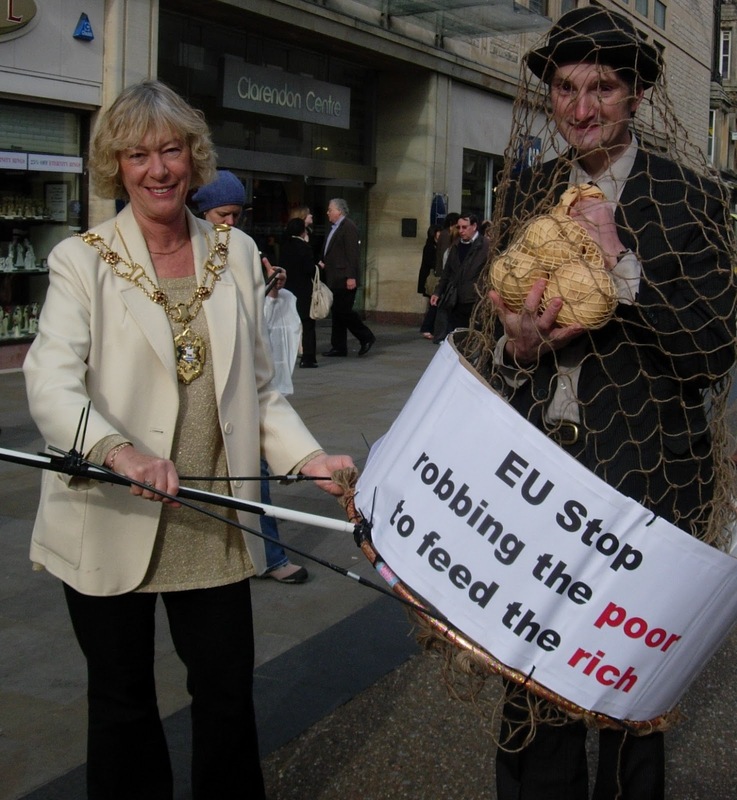 Left photo: EU trader (Kelvin) tries to steal food out of the hands of a poor person (Chris). Right photo top: WDM campaigner (Sam) takes action and captures the trader. Right photo bottom: Susanna Pressel captures the evil trader. And on this occasion, we got on Radio 4 - Broadcasting House (Sunday mornings). They were in town to interview people re the Bullingdon Club and came across our stunt. Ended up interviewing us too, and town Mayor Susanna Pressel who was supporting our action, and voila - Oxford WDM become national radio stars. The disproportionate effects of climate change on people in developing countries also looked at the Royal Bank of Scotland's investment in blood oil in April 2010. Photo: Tina, Roger, Kelvin, Andrew, Martin, and Sam on the ground with the dirty oil footprints. Then in April 2011, it was Barclays turn; highlighting the part they play in creating hunger by pushing up the price of key staple foods via food speculation. Photo: Chris trying to sell food at inflated prices (bread £200), Barclays eagle and Andrew. And a short video of the stunt with Adam Ramsay of People and Planet. 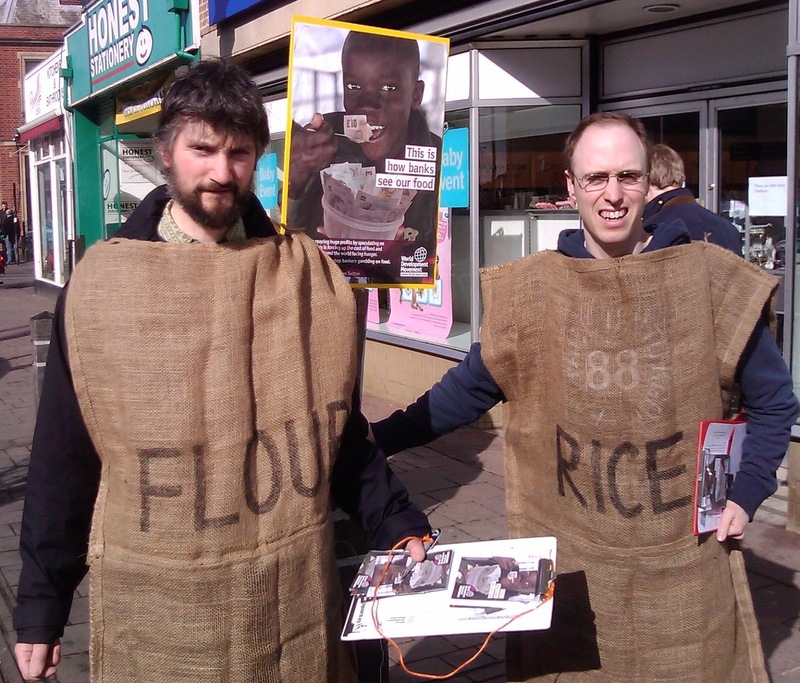 We did another food speculation stunt outside Tesco on Cowley Road in March 2012, getting nearly 100 campaign cards signed, along with attracting attention with the particularly fetching props. Photo: Kelvin & Sam. The group also frequently gets in great speakers for public meetings. 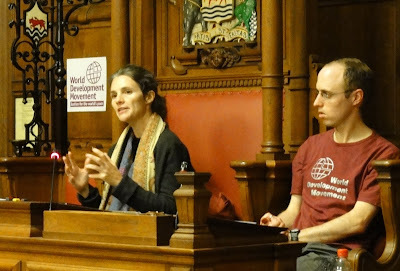 In November 2012 Sabina Alkire, director of the Oxford Poverty and Human Development Initiative (OPHI). for talk on the measurements of poverty at the Oxford Town Hall. Though we are moving to Sheffield, I'll still be flying the flag for WDM. 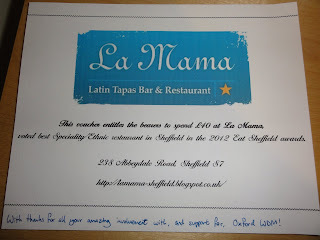 I am now on national WDM council, and am looking forward to joining the Sheffield WDM Group once we have settled in. I want to say thanks to the Oxford WDM Group, for such great campaigning and friendships. You have been an inspiring group of campaigners to work with, putting your values into practical action and campaigning for justice for the world's poor. It's also been a lot of fun! It's been a privilege and pleasure to campaign with you all over the last 12 years. thanks for the lovely gift too!